Cairns is the gateway to the Great Barrier Reef Marine Park, Daintree Rainforest and Cape Tribulation in Tropical North Queensland, Australia. Cairns is a cosmopolitan city with a population of approx. 140,000 that is very focused on the tourist industry; particularly popular with international tourists. Japanese tourists are especially catered for, with many shops' signs being written in Japanese, as well as English. The city is surrounded by rainforest and can be used as a gateway to destinations such as Kuranda and the Daintree. Besides tourism, the city is supported by agricultural activities which include sugar cane, bananas, coffee, tea and the world's first tropical fruit wine region. There is a lot of accommodation to suit all budgets with plenty of drinking establishments and restaurants catering to all types of tastes. The atmosphere is laid back and unpretentious, while prices are relatively inexpensive. There are a plethora of clubs and coffee shops in the city, all overflowing with international tourists which helps to give Cairns its cosmopolitan feel. Cairns esplanade and The Pier market place are centrally located in the CBD. The retail district has something to offer visitors from anywhere in the world. There are plenty of cafés and shopping plazas and an expanding multicultural art scene. The city has a vibrant night life with restaurants offering fine dining with international cuisine from cultures all over the world. Staying at a 5 star hotel the city centre is a popular option for upscale tourists - though many upmarket tourists will go to Port Douglas instead. Cairns is a noted backpacker's hub, though, with plentiful and popular low-priced dorm-style accommodation. There is no swimming beach to speak of in central Cairns (you will only find a mud flat if you head to the ocean), although there are many choices just north and south of the city. A large outdoor, lagoon-style pool is in the centre of the Cairns City area, which is very popular throughout the year with tourists and locals alike. If you are aiming to have a beach side resort holiday, there are several resorts a short drive north of Cairns. Sightseeing charter tours can be booked from most major resorts, or (avoiding the travel agents) from the charter companies themselves. Cairns, as the largest city in the region, is a popular jumping-off point for exploring the Great Barrier Reef and the Daintree National Park, as well as the Atherton Tablelands and the Queensland Outback. Season: Peak tourist season is from around May to November and accommodation prices rise during this period. The wet season in Tropical North Queensland starts from December and the weather is wet and humid with high rainfall, in which Cape Tribulation and the Daintree are susceptible to flooding. Parts of the Daintree National Park are only accessible by 4WD during this time, but 4WD buses will take you there nonetheless. Cairns International Airport (IATA: CNS) is the primary international gateway into the region and is also served by many domestic flights. Cairns airport has two terminals, a domestic terminal and an international terminal, both within walking distance from each other. Jetstar from Tokyo-Narita, Osaka-Kansai, Denpasar (Bali), and Singapore; codeshares with their parent carrier, **Qantas. Air Niugini flying from Port Moresby. Air New Zealand flying from Auckland. Cathay Pacific from Hong Kong 4 times a week. Airlines PNG flying from Port Moresby, Tabuil and Mt Hagen. Qantas flying from Horn Island, Weipa, Gove/Nhulunbuy, Alice Springs, Yulara (Uluru), Melbourne, Sydney, and Brisbane. Virgin Australia flying from Melbourne, Sydney and Brisbane. Jetstar flying from Adelaide, Melbourne, Sydney, Darwin, Perth, the Gold Coast, and Brisbane. Tiger Airways from Melbourne, Sydney & Brisbane. You can also walk to the city centre, about 7km or 1.5 hour. The first 2km are along the airport access road, you need to walk on the bike lane. The airport access road is not designed for walking, during the day it will be hot walk (not the best way to start your holiday) and not really safe as the airport access road is a busy road. Then turn left, about 1km through a suburb and along a park. Then you can start following a beautiful stretch along the beach to the Esplanade. Cairns Railway Station is connected to the Cairns Central shopping centre, within walking distance of the waterfront and most hotels. You can take a taxi to your hotel and if you book prior to arriving at the Cairns Railway station a shuttle bus can pick you up an take you to your hotel. Queensland Railways' Tilt train and The Sunlander services connect Cairns to Brisbane (via Townsville and Rockhampton), taking 32h for the full journey. Even though the Tilt Train reaches speeds of 160km/h between Townsville and Brisbane, the diesel Tilt Train running between Brisbane and Cairns runs at a maximum of 80km/h between Townsville and Cairns due to the poor alignment of the line. Although a trip between Townsville and Cairns takes 4 hours by car, it can take over 7h by train. The Tilt Train departs Cairns for Brisbane at 9:15AM on Wednesdays and Sundays, arriving at Townsville at 3:15PM and Brisbane at 9:10AM the next day. The Sunlander departs Cairns for Brisbane at 9:15AM on Tuesdays, Thursdays and Saturdays, arriving at Townsville at 4:10PM and Brisbane at 3:55PM the next day. The Kuranda Scenic Railway , also operated by Queensland Rail , runs from Cairns to Kuranda, stopping over the majestic Barron Gorge to allow passengers to leave the train and enjoy the beautiful view over the water. Trains depart Cairns at 8:30AM and 9:30AM daily arriving at Kuranda at 10:15AM and 11:15AM. The Savannahlander also travels from Cairns to Kuranda but then continues on to the outback town of Forsayth. It leaves Cairns at 06:30 every Wednesday with a compulsory overnight stop at Almaden (with transfers available to Chillagoe), before arriving at Forsayth Station at 17:45 on Thursday. The Savannahlander does not run between December and March. The 1,700km Bruce Highway running south along the coast connects Cairns to the state capital of Brisbane. It takes 22h to drive without stopping, and you should allow at least 2-3 days of solid driving, or longer for a more relaxed pace of drive up the coast. There are regular towns along the coast which make good stopping off and sightseeing points. The centre of Cairns is small enough to cover on foot. Frequent Sunbus buses depart from the city centre to the suburbs and Northern Beaches. You can buy a 'daily' bus ticket that lasts until the last service that night. The last services heading back into the city are generally around 10pm - 11pm, while the last services out of the city are between 11pm and midnight. Apart from the town centre, a car is useful to see the surrounding attractions if you are not taking a tour. Catch an amateur rugby game in town if you can, the locals play a mean game, and it's a great way to meet local folks. International cricket is sometimes played in Cairns at Cazaly's Stadium . Time your visit right and you could catch a great game for just a couple of dollars. Cairns is home to one of Australia's best basketball teams, as well as basketball's most famous mascot, Joe Blake the Snake. Centenary Lakes, Collins Ave/Edge Hill, opposite the Botanic Gardens. Rainforest boardwalk that goes directly through the forest and ends at several small lakes and creeks. There is also a little park with picnic areas. Caution: The lakes are crocodile habitat. City Botanic Gardens, Collins Ave/Edge Hill, +61 7 4044 3398. M-Fr 07.30-18.30, Sa-Su 08.30-17.30. Tropical vegetation and plants used by Aboriginal people, Gondwana Evolution trail, Bamboo Forest, nice Rainforest Boardwalk. Café. Tanks Art Center nearby. Free. You can reach it with bus 130. Lake Placid, Barron Gorge National Park, between Cairns and Kuranda. Peaceful lake surrounded by rainforest, with picnic spots. Mount Whitfield Conservation Park, Collins Ave, north of city centre. Rainforest area with several marked walking tracks, views of the city. Northern Beaches There is no beach in Central Cairns, but there are several beaches in the north that can easily be reached by bus. Although swimming is not always recommended, they are all beautiful and tropical, and ideal places to relax and walk. These beaches include Trinity Beach, Yorkeys Knob, Palm Cove, Holloways Beach, Kewarra Beach and Clifton Beach. Smithfield Conservation Park, McGregor Road, close to James Cook University, north of the city centre. A large area of rainforest with several walking tracks. Rather off the beaten path and mostly visited by locals. Cairns is a hotspot for wildlife diversity in Australia and is an ideal place to see a huge variety of birds, mammals, and reptiles. Places such as Mount Lewis, Lamb Range, or Mount Hypipamee are ideal locations to see anything from a Cassowary to Tree Kangaroos. Cairns Regional Gallery, Cnr Shields & Aplin St ☎ +61 7 4046 4800. Changing exhibitions from Australian artists, located in a beautiful 1930s building. M-Sa 10:00-17:00 and Su 13:00-17:00. Free Entry. Cairns Museum, Cnr Shields & Lake St ☎ +61 7 40 515 582 Small museum that depicts the history of Cairns and the area, special emphasis on mining, farming, Cape York air, timber industry, Asian communities. $5, M-Sa 10:00-16:00. Samurai Gallery Australia, 22 Shields St ☎ +61 7 4051 5196 Samurai Gallery Australia is the only gallery in Australia dedicated to the Arts, Armor and Arms / Weaponry of the Japanese Samurai Warrior. $10, Wednesday, Thursday, Friday 11am–4pm and Saturday 10:30am–3pm. Australian Armour & Artillery Museum, 2 Skyrail Drive, Smithfield ☎ +61 7 4038 1665 The Australian Armour and Artillery Museum is a museum dedicated to tanks, armoured vehicles and artillery from the Second World War and post war periods. $25, Everyday 9:30am–4:30pm. Cairns is an adventure sports enthusiast's paradise: every second shop is a tourist information centre with signs blaring "dive dive" or "tandem skydiving". Its location close to the ocean, the mountains and the rainforest gives travellers lots of choices of activities. Standby rates are ubiquitous: many of the more expensive activities, including scuba diving and skydiving, are up to $150 cheaper if you are prepared to go on standby for a cancellation. If you book trips through hostel, you might get 1 night free stay with them e.g. Asylum Cairns has tie up with Cairns Dive Center. 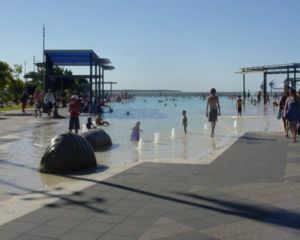 Swim in the artificial "lagoon" (a public swimming pool with some sand on one side) on the promenade near the pier. The lagoon is unfenced and free to use. A shallow depth(max depth 1.5 m) makes it ideal for families with children. The lagoon is a good place to cool off especially during "stinger season" between October and May (cf. Dangerous creatures in Australia) when local beaches should be avoided. Note that there are also no beaches in Cairns itself - one can catch a bus to the northern beaches, but the sand there is rather rough, and during stinger season the area protected by netting at the northern beaches is no bigger than the lagoon. Sun-bake or people watch on the grassy part of the promenade near the lagoon. On a sunny day, even in the middle of Cairns's tropical "winter", there will sometimes be more sun-bakers than there is visible grass. Have a barbecue on the promenade. Cairns has free barbecues scattered generously among the picnic tables on the grass. Go walking - Cairns is surrounded by rainforest clad mountains, and there are nearly 200 walking tracks in this World Heritage Area. Keen walkers should keep an eye out for Tropical Walking Tracks, found at local bookshops and adventure shops. It lists all of the tracks around Cairns as well as those between Townsville and Cooktown and has maps of them and 'how-to-get-there' directions as well. Many coach tours depart Cairns daily, with a couple of hundred to choose from. There are rainforest tours to Mossman Gorge, the Daintree River, Cape Tribulation, and the Cairns Highlands (Atherton Tablelands), specialised 4WD tours, city sights tours, tours to wildlife parks, outback tours. A number of Cairns operators run day and liveaboard scuba diving trips from Cairns. For seeing the Great Barrier Reef, the smaller dive boats provide the best experience, both for diving and for snorkelling. The larger operations have more amenities - better food, larger and faster boats, more activities, but sometimes provide a poorer underwater experience, as the underwater areas that the larger boats visit are heavily overused, and somewhat barren of coral and fish. Your mileage may vary. If you are sick of the sea, head up in the air. Hang gliders fly off Rex Point Lookout, halfway between Cairns and Port Douglas on the Captain Cook highway. On weekends, it's common to see multiple gliders soaring the sky above the scenic lookout, and the winter season provides consistent flight conditions. The Cairns region has some of the best weather for ballooning in the World and so trips go year round and are rarely cancelled. The trips go inland to the Atherton Tablelands and take off at first light at Mareeba, finishing around 10AM and can connect directly to a Great Barrier Reef tour or drop you in Kuranda. Rafting in North Queensland has the advantage of departures all year round, tropical water temperatures and ease of access to compliment breath-taking scenery and rapids. The region's white water rafting adventures are suitable for all levels of fitness and enthusiasm. Ride through our planet's oldest continuously growing tropical rainforests on rivers that still run totally wild. Night Markets, 71-75 The Esplanade. ☎ +61 7 4051-7666. The night markets operate every night of the week till late. They are a collection of stalls catering mainly to tourists: you can buy lots of clothes, games and Australiana. Pearls. Of course, you can buy pearls everywhere and the price range is huge. In Cairns you can find shops where you can buy real A-grade pearls from the Torres Strait - not cheap, but at the end more than fair in comparison to the European or US prices for the same quality level. Cairns Central, Cnr MacLeod & Spence St ☎ +61 7 4041 4111. Large shopping centre with more than 180 shops, restaurants and takeaways located in the city centre. Smithfield Shopping Centre, Cnr Captain Cook & Kennedy Hwy ☎ +61 7 4038 1006. A shopping centre with two supermarkets, clothing and book shops as well as takeaways. Located on Captain Cook Highway and therefore a good place to stock up on the way north. Exchange Bookshop 78 Grafton St. All kinds of second hand books in good condition, especially a good section of classic literature and also a selection of recent books by Australian writers and guide books. Rusty's Market 57-89 Grafton St, ☎ +61 7 4040-2705. F 05:00-18:00, Ss 06:00-15:00, Su 06:00-14:00. Storefronts are lined with many kinds of fresh vegetables and fruits picked locally. As with much of Cairns, you can divide the city into the Esplanade and the places within a block of it, and the rest of the city. The Esplanade is littered with bar and grill places supplying red meat and beer all in the one place, and with seafood restaurants. It's relatively difficult to find anything open before 11AM, since they expect the clientele to be sleeping in. The rest of the city has small cafes and milkbars catering to locals and budget travelers. The number of Japanese tourists here makes Japanese food a fairly reliable option, although prices can be steep. A number of the more expensive restaurants on the Esplanade, particularly towards the north end, offer discounts of 20-30% for early birds: usually you will need to order by 6:30PM and pay and leave no later than 7:30PM to get a discounted meal. La Pizza Trattoria, 93 The Esplanade. ☎ +61 7 4031-2646. La Pizza Trattoria has good pizza. It lures most patrons in by letting them wander past the pizza chef kneading the dough as they smell the baking pizzas. Medium sized pizzas $17. Open 7 Days 7AM until late. Villa Romana Trattoria , Aplin Street (cnr The Esplanade). ☎ +61 7 4051-9000. (fax:+61 7 4031-5557). Italian meals with some good seafood options and overworked wait staff. 25% discount if you order before 6:30PM. Meals are $25-$40. Hide's Coffee Cafe, Shop 7, 87 Lake Street. ☎ +61 7 4041-1899. Hides Coffee Cafe, a couple of streets back from the Esplanade, is a good place for an under $10 breakfast or lunch. Order at the counter and remember to keep an eye on the collapsing umbrellas at the outside tables. They have free wifi for guests. Sushi Express, Shop 28 Orchid Plaza, 79 Abbott Street. ☎ +61 7 4041-4388. (fax:+61 7 4052-1277). A sushi train made up to look like the Kuranda Railway, this place is popular but not wildly busy. The tempura seems to get more attention than the sushi or sashimi. Plates from $2.50-$4.50. Perrotta's At The Gallery, 38 Abbott Street. ☎ +61 7 4031-5899. If you want to escape from several evenings touring the bar and grill places, Perotta's is just off the Esplanade and does more sophisticated Western food. Try the French toast with roast pear for breakfast. Breakfast, lunch and dinner approximately $20. Donnini's Ciao Italia, at the Pier Marketplace, features indoor and outdoor dining with an ocean backdrop. Located at The Esplanade, and is within walking distance of many of Cairns' hotels. Meals from around $20-$25. Mövenpick of Switzerland, 95-105 The Esplanade. ☎ +61 7 4041-3555. Interior is based on white and there is the ocean in front of this shop. It has about 18 kinds of ice creams, waffles and many kinds of drinks. Daily 11:00- 23:00. Cairns has pubs and bars to cater to travelers, students, and locals. The nightlife is vibrant. Rattle 'N Hum, 67 The Esplanade. ☎ +61 7 4031-3011. The Rattle 'n Hum is a bar and grill in the midst of one of the busiest parts of The Esplanade. It's quite large and getting a seat is seldom a problem: sit out back once they light torches in the evenings. Competition for the pool table is not formidable so you should be able to get several games in. They do a number of main meals, including wood-fired pizza for around $20. The staff are highly variable in quality, ordering a cocktail can be risky, but they're certainly able to pull a beer. Blue Sky Brewery Bar & Restaurant  , 34-42 Lake Street. ☎ +61 7 4057-0500. Situated in the heart of Cairns CBD. Its bar, restaurant and function rooms attract both locals and visitors. It has a wide selection of boutique beers brewed onsite, a comprehensive wine cellar, a diverse modern cuisine, and dynamic, yet relaxed Tropical North Queensland atmosphere. All of Blue Sky's handcrafted beers are unpasteurised and brewed naturally, giving a distinct depth of flavour and fresh taste. Rhino Bar Cairns  , corner of Lake & Spence Street. ☎ +61 7 4031-5305. The Woolshed Chargrill & Saloon Bar  , 24 Shields Street. ☎ +61 7 4031-6304. (fax:+61 7 4041-2283). If you are looking for a place to find all the travelers, go to the Woolshed in downtown Cairns. Cairns has seemingly endless places to stay, but they do book out during high season (June - September). Cairns is the backpacker capital of Northern Queensland and there are over 20 hostels, all offering basic bunks in the $14-18 range. Mid-range Cairns hotels, resorts, and inns are listed here alphabetically. The market town of Kuranda is interesting for a few hours. You can drive, catch the Kuranda Scenic Railway from Cairns or Freshwater stations, or take the Skyrail Rainforest Cableway . Continuing past Kuranda, you can drive up the mountains (stopping at various roadside lookouts) to the Atherton Tablelands, i.e. Australian farm country. Stop at any tourist center to pick up pamphlets for wineries, distilleries, dairies, farms, chocolate factories, and all manner of agro-touristic offerings. Keep in mind that most will close around 3 to 4 pm, so get an early start! Other points of interest include the massive termite mounds by the side of the road, as well as the famous Curtain Fig Tree. If you're day tripping, make sure you head back before dark-- those windy mountain roads are no joke! Lake Tinaroo is also located on the Atherton Tablelands. Lake Tinaroo is great for swimming, water sports, bush walking, fishing and camping. Mareeba, the edge of the outback, where the sun shines 300 days a year, and they produce 80% of Australia's coffee crop. With a tour to the area you don't need a car. Mossman Gorge 70 min north of Cairns is a good place to cool off. Avoid arriving at the same time as the tour coaches, and take great care swimming as the currents are very strong. The Daintree, officially the world's oldest rainforest, is located an hour and a half north. Green Island and Fitzroy Island, both resort islands that welcome day trips, are within 45 minutes of Cairns by ferry. The Savannahlander  is a four day train journey that departs from Cairns to the outback town of Forsayth. It's a unique way to see the Chillagoe caves and Undara lava tubes. Cooktown is around 3 hours north along the coast from Cairns, and has history, national parks and beaches to explore. Mission Beach a lovely tropical beach is about an hour and a half drive south. It is the gateway to Dunk and Bedarra Islands. Mission Beach is one of the few places you might see the very rare and endangered Cassowary bird. Port Douglas a seaside resort town is an hour north along one of the nicest drives in Australia. Port Douglas is another gateway along with Cairns to the Great Barrier Reef and the Daintree Rainforest. This page was last edited on 12 February 2019, at 07:13.